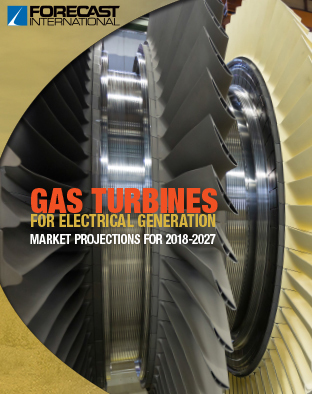 Forecast International's market analysis of gas turbine-powered electrical generation for 2018-2027 projects that sales will total $119.28 billion over this period, an increase of 6.3 percent over the comparable figure for the period 2017-2026. This steady increase shows that the utility and industrial power generation market will continue to provide a strong stimulus for the production of gas turbine machines. However, this rate of increase is significantly less than the rate of increase in demand for electrical power during this period. Global electricity demand is projected to increase by about 85 percent as living standards rise, economies expand, and the electrification of society continues. About half of the projected global growth in electricity demand through 2040 will come from the industrial sector. For full details, please download the FREE Gas Turbines for Electrical Generation white paper.